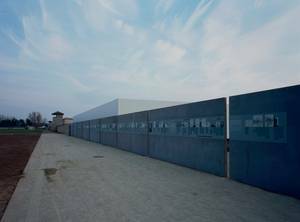 The permanent documentary exhibition “Murder and Mass Murder in the Sachsenhausen Concentration Camp from 1936-1945” is part of the central memorial site, “Station Z”. This was the name given by the SS to a building built in 1942 which was both a crematorium and an extermination site. “Z”, the last letter in the alphabet, cynically represented the last station in the prisoner’s life. There were four crematorium ovens, a gas chamber and an area for shooting executions. The completely preserved building was blown up by the Barracked People’s Police from the GDR in 1952/1953. Initially, while constructing the Memorial Site, the architects secured the foundations and the remains of the ovens and then built a monumental roof above them. This was taken down in 2004, not least because of the irreparable structural damage. This completely newly designed central memorial site was inaugurated in April 2005 for the occasion of the 60th anniversary of the liberation. The cube designed by Prof. HG Merz appears to be levitating over the foundations of “Station Z”. It provides not only protection for the historical relics, but also creates a dignified memorial space. The design has been awarded numerous international prizes for architecture. At the former site of “Station Z”, the destroyed historical camp wall is traced out by fibre concrete slabs, with an Open Air Documentation. The history of the location between 1941 and 1989 is documented inside of the memorial site. Death and killing were omnipresent in the Sachsenhausen Concentration Camp. Thousands died due to malnutrition and illness, as a consequence of brutal and random abuse or from the inhuman conditions of forced labour. From the very beginning, individuals and groups were murdered in answer to direct orders from the highest leadership within the National Socialist regime, from the Reichsführer SS, from the Reich’s Security Head Office or the Concentration Camp Inspectorate. Even the commander and his SS men planned murders and then carried them out. The exhibition is dedicated to these homicidal crimes which amount to acts of murder punishable by criminal law. Alongside the technical facilities set up for the killing of people, examples of murder and mass murder campaigns are also presented. On the one hand, this deals with the crimes which were committed against the Sachsenhausen Concentration Camp prisoners. On the other hand, it deals with the murdering of people who were primarily deported to the concentration camp close to the Reich capital through the Reich Security Head Office in Berlin and the Berlin Gestapo on Alexanderplatz for the purpose of their execution in the concentration camp. The exhibition attempts to display, as representatively as possible, the variety of causes for persecution as well as the plurality of victim groups. In the process, the life stories of those murdered is made the central focus. The examples presented of mass murder campaigns range widely. For example, one presentation details the fate of the legal advisor for the Confessional Church, Friedrich Weißler from the Sachsenhausen Concentration Camp’s early days. In February 1937, Friedrich Weißler was brutally murdered in the cell block by SS men because of his Jewish origins. Another example is the systematic mass murder of sick and weak prisoners shortly before the camp’s evacuation in 1945. The largest campaign of mass murder, against more than 13,000 Soviet war prisoners in late summer 1941, is presented in great detail. However, information about the perpetrators is also presented. Some murderers, especially the “desk perpetrators”, were not punished or came out of it with relatively minor prison sentences. Others, for example those who were directly involved with the committing of murder, received sentences of long imprisonment by the Allies or the German courts.